Beginning as a series of online cartoons, “Diary of a Wimpy Kid” was an instant sensation when Jeff Kinney’s first novel was released in 2007. The novel spent almost three years on the New York Times children’s best seller list, printed in 53 languages and has sold 180 millions of copies around the world that spawned a series of movies which has already reached 225 million in global box office. Diary of a Wimpy Kid brought us the adventures of Greg Heffley, a wise cracking preteen who must survive the treacherous jungles of middle school. 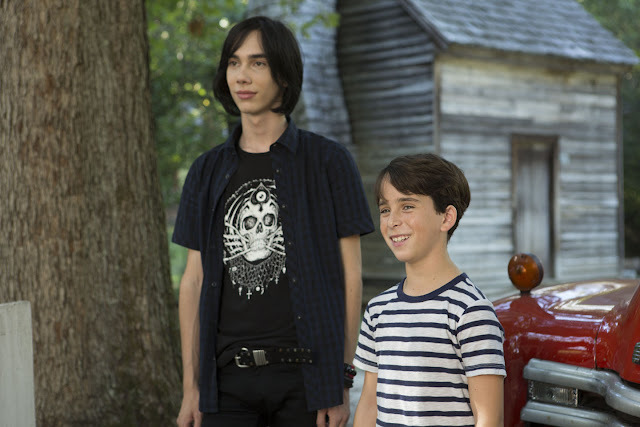 The second film, Diary of a Wimpy Kid: Rodrick Rules focused on Greg’s family and his relationship with his older brother Rodrick. The third film, Diary of a Wimpy Kid: Dog Days focused on Greg’s family and his relationship with his father and best friend Rowley. The ninth installment in Kinney’s book series and the latest movie adaptation “Diary of a Wimpy Kid: The Long Haul” takes us on a Heffley family road trip to Meemaw’s 90th birthday that goes off course when Greg Heffley (Jason Drucker) schemes to go to a gaming convention. In The Long Haul, Greg hatches his latest plan to avoid being infamous and finally get the fame he believes he deserves. Suffering a brutal blow to his ego when footage of an unfortunate diaper incident goes viral, Greg takes matters into his own hands to restore his “rep.” Of course, the obvious way is to make an even cooler viral video with the help of YouTube sensation Mac Digby whose auto reply email message inviting Greg to meet him at the Player’s Expo hurls Greg’s imagination into overdrive and takes him on yet another venture of pandemonium featuring brilliantly animated illustrations. Ready for a nice, long summer, the all new cast with Jason Drucker as the wimpy kid Greg is looking forward to just hanging out, but his mother, Susan (Alicia Silverstone), wanting to focus more on family and not gadgets decides the family needs to take a road trip to their great-grandmother’s birthday celebration. At first, Greg wants no part of this, but soon realizes this is his ticket to the Player’s Expo. His father Frank (Tom Everett Scott) is slammed at work and uncertain driving there is a good idea. His brother and still the chief tormentor. Rodrick (Charlie Wright) is only focused on his band and just wants money from his parents to repair his damaged van which isn’t happening. Despite everyone except little Manny (Dylan and Wyatt Walters) disapproving, Susan makes the family pack up their minivan with Frank’s old boat attached and they hit the road for the long haul. “Diary of a Wimpy Kid: The Long Haul” is now in cinemas nationwide from 20th Century Fox distributed by Warner Bros.